“The fact that the BMF offered sector-specific training was a major factor in our decision to join. We felt it would be more meaningful to our staff to have training delivered by someone who understands our business. There are a number of other advantages to bespoke training. We recognised that standards of customer service had moved on in the last 10 years and we wanted to make sure that everyone, from the people making our fences to the drivers delivering them are fully on board with the changes we are making. "I too thoroughly enjoyed the experience … the week could not have gone better. This was a crucial course at a crucial time for the development of the business as we have moved from a boom time to a huge reduction in construction activity on the island. We have to change the culture and mind-set so we become pro-active. You personally could not have performed any better nor could you have put any more effort into the five days, you inspired everyone, me included, you kept the interest of even the most die-hard attendees and everyone without exception enjoyed and benefited from your delivery and humour. Thank you most sincerely. I will not hesitate to contact you when we need more assistance however that will now be in Autumn at the earliest. I will also be pleased to give any reference to others who may be considering “using” you. Everyone either John or myself have spoken to rated the course and yourself very highly. They thoroughly enjoyed it and yes they already feel they have got a lot out of it. Thank you. It’s not always possible to get them into a room for the day and keep their attention and momentum. Something given your knowledge of the trade, you no doubt understand that it’s not something they are used to or relish. However you managed it perfectly and they can’t wait for the next course. We ourselves evaluate all the training and once we have received all the forms back, I will forward on to you. Thank you for your kind words regarding the lads. Yes we are very proud of them. They all work extremely hard and they do a fantastic job. This training will only go to make their lives easier and hopefully give them more of a work /life balance. Merchant members talk about the value of the BMF training opportunities. Darren Brookes, JCB Industrial Business Development Manager says "One of our main objectives when joining the BMF as a supplier member was to further develop our extensive network within the Merchant sector. The opportunities to do this are numerous with regular Regional Meetings, Business Forums, Major Conferences and Training events taking place across the country. 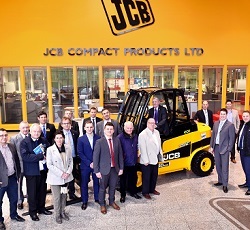 JCB has recently opened and is fully supportive of the BMF Centre of Excellence programme and we look forward to engaging with our local customers for regional meetings & training events at the JCB Group over the coming years. At JCB our products are of the highest quality and will deliver significant innovation and benefits to our customers. Becoming a BMF member proved a big help in helping JCB Industrial communicate these benefits to our key customers. I would have no hesitation in recommending any supplier or service provider to the Merchant Sector to see how the BMF can help you fully engage with your prospects and customers." JCB have worked with closely with the BMF since 2015, enhancing their Teletruk range specifically for the Merchant market.